Danielle Wysocki blogged at “The Jersey Catcher,” a sports blog for women. 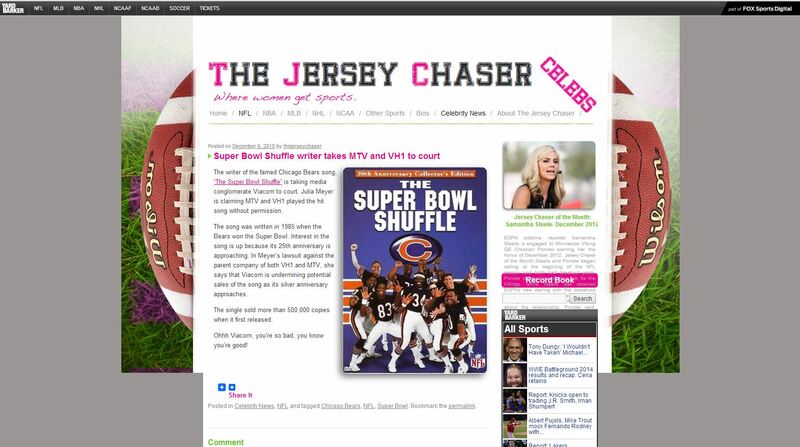 On December 6, 2010, she blogged about a lawsuit over the 1985 novelty rap song “The Super Bowl Shuffle,” sung by members of the Chicago Bears football team. (I’m reluctantly including a link to the video, but I recommend you watch it mostly to remind yourself how bad 80s pop culture could be. Especially note Tomczak’s head-shaking fake guitaring and Steve Fuller’s self-deprecating, uh, “rap.” Oh gawd, the whole thing is absolutely awful). As is common for bloggers, alongside the post Wysocki included the cover image of the DVD at issue. The DVD cover (as well as the album cover) includes a group photo of the “rapping” Chicago Bears players (to me, it looks like many of them are doing “jazz hands”). The plaintiff claims a copyright in the photo and that Wysocki’s display of the DVD cover on her blog infringed the copyright. If these allegations were true, it highlights the toxicity of photos used in commercial settings. In many circumstances, republication of a DVD cover or album cover should be excused by 17 USC 113(c) or possibly other doctrines. Still, shame on whoever used the plaintiff’s photo for the song and DVD without obtaining ownership or a strong enough license to protect downstream republications. Distributing a song that became a cultural icon with an insufficiently exhausted copyright license for its cover creates the potential for lots of other folks to become unintended potential defendants. The result is actually quite chilling to ordinary social discourse, as it makes sense that many people would want to show the album cover or DVD cover in discussing or critiquing the song. This rationale won’t always work for bloggers, but it does generally apply when bloggers want to show an artifact associated with a lawsuit. More generally, it’s the third blogger fair use win we’ve posted about in the past 2 months. That makes this case part of a nice streak of judges protecting bloggers from overreaching plaintiffs. See also Griping Blogger Can Show Photo Of Griping Target–Katz v. Chevaldina and Fair Use Protects Video Republication To Demonstrate Speaker’s Inconsistent Statements–Caner v. Autry. The rest of the case is pretty interesting. The plaintiff tried to hold some Fox Sports entities liable for Wysocki’s republication. Fox owns a service called Yardbarker, which entered into a linking agreement with Wysocki where Yardbarker would link to selected blog entries and the blog would add Yardbarker’s frame to the top of its pages (see the screenshot above), and the parties would split resulting ad revenue. Yardbarker didn’t host any of the blog’s content (including the image at issue in this case), except for text excerpts included with the promotional links. Because it didn’t host the photo, the court dismisses Fox’s direct liability per Flava Works and Perfect 10 v. Amazon. The contributory liability claim fails because there wasn’t evidence that Yardbarker/Fox knew that Wysocki had infringed or was going to infringe. The vicarious liability claim failed because Yardbarker/Fox had insufficient control over Wysocki’s site; all they could do was terminate the linking agreement. Fox also escapes a 1202 claim because it didn’t distribute the photo or have the requisite scienter about the alleged CMI modifications. The huge problem here, as you know, is that the only way to win is to spend huge sums of money defending yourself in legal proceedings, and then a Judge rules “you are OK, fair use applies.” The “winner” is now looking at a legal bill that is likely in excess of $100,000 and which could go higher if the other side appeals. Fair use is a fine idea in theory, but in practice, without an inexpensive means to use the defense, it is only feasible for people with vast amounts of spare cash. What is desperately needed in copyright law is a cheap, fast, easy-to-apply rule which tells everyone what is, and what is not allowed. We don’t have that in copyright law now. Totally agree. Fortunately, we have seen some bloggers win fair use cases on a motion to dismiss. Even then, it’s too expensive. Judges can award fees under 17 USC 505, but I don’t think that’s reliable enough to give comfort to bloggers. I do like the anti-SLAPP solution, and I wish we extended the anti-SLAPP principles to a broader range of content publication problems faced by bloggers. Eric.